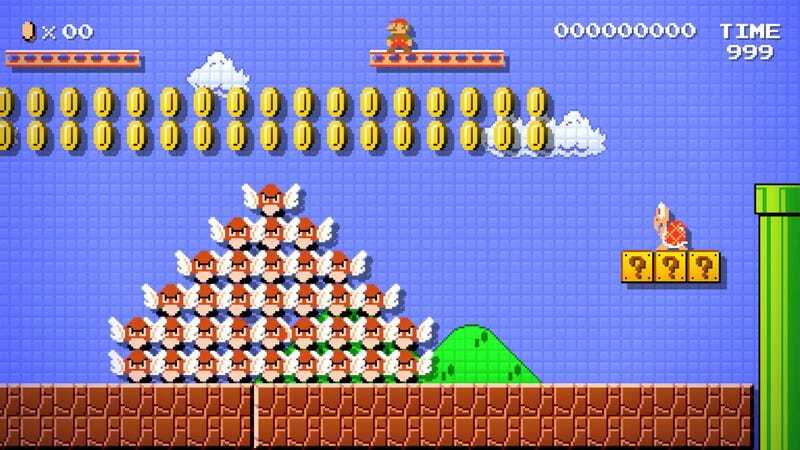 Nintendo has a real problem on its hands with Mario Maker. Left and right, creators are seeing their levels removed from the online servers without an explanation. David “GrandPOObear” Hunt, a speedrunner who makes a living streaming games, is the latest victim. All of his levels have vanished. As Hunt prepped for an appearance at this week’s speedrunning event Californithon, he discovered his Mario Maker stages had disappeared. When a stage is deleted from Mario Maker’s servers, you cannot change it and re-upload it. You have to build the level again, from scratch, and hope Nintendo doesn’t find it a second time. And because Nintendo doesn’t provide creators with feedback on why a level is removed, it’s a crapshoot. Hunt, who estimates he’s spent more than 100 hours uploading levels, is telling the truth: his Mario Maker profile is bare. Stars are equivalent to “likes” in the Mario Maker community, a way for players to recommend a stage. Nintendo regularly deletes unpopular stages, making stars a precious commodity. It keeps your stages alive. “Streaming Mario Maker is 90% of my stream, which is 90% of my overall income so far in 2016,” Hunt told me today. It’s not hard to imagine why this is so distressing, then. After the levels were deleted, Hunt got on the phone with Nintendo customer support. He recorded the conversation and uploaded it. The customer service representative didn’t have much to offer. His account hadn’t been flagged for inappropriate activity, showing no marks of cheating or level infringement, common reasons levels are taken down. The phone call ended without any resolution. As with every one of my stories on this topic, Nintendo didn’t respond to my request for comment. This isn’t the first time Hunt has run into the same problem. In mid-January, Nintendo removed his “Pile of Poo-POOgatory” level from the online servers. A Kaizo-influenced stage, it was one of his most popular. For more than 30 minutes, Hunt patiently talked to various Nintendo customer service representatives about his situation. The Mario Maker community isn’t only policed by Nintendo. Players can report stages, too, and it’s ripe for abuse. Creators who stream levels have to be especially wary of trolls; all it takes is a few people reporting a level to have it taken down. And as you can imagine, getting it back is a nightmare. Pile of Poo-POOgatory was flagged for language. On the phone, Hunt argued this was unfair, as his online handle is poo-related, and his other levels that included the word “poo” hadn’t been taken down. “You’re deleting something because of my name,” he said. “I completely understand where you’re coming from,” said the rep.
After putting Hunt on hold, the rep returned with an answer of sorts. Hunt offered to change the level’s name, if that was the root of Nintendo’s problem, but the rep said it wasn’t possible to do that. The way the system works, they explained, was that once a level is removed, the only way it comes back is if Nintendo decides the level, name and all, is acceptable. The rep offered to pass on Hunt’s feedback, to hopefully influence “how we handle stuff in the future,” but said it wouldn’t change overnight. There was one problem, however. If the rep escalated Hunt’s request, it would require Nintendo to examine everything he’s created. This would mean looking at his other levels. If they decided to reject Pile of Poo-POOgatory, they might reject all of his stages. Hunt took the risk. A week or so later, in the middle of a stream, Hunt got a call. “We were able to get your level returned to Miiverse,” said the Nintendo rep.
Overjoyed at the news, Hunt thanked them for their help. That was in the middle of February. A little over a month later, all of Hunt’s levels are gone, even the ones that didn’t include joking references to poo (i.e. OOP fo elip: doesn’t feel right). Understandably, Hunt feels targeted. He’s worried the way he’s publicly called out Nintendo for their policies (or lack thereof) means he’s been punished for speaking out. Unlike other Mario Maker creators whose levels have been removed, Hunt has a video trail documenting his experience. You’re going to kill this community, Nintendo.